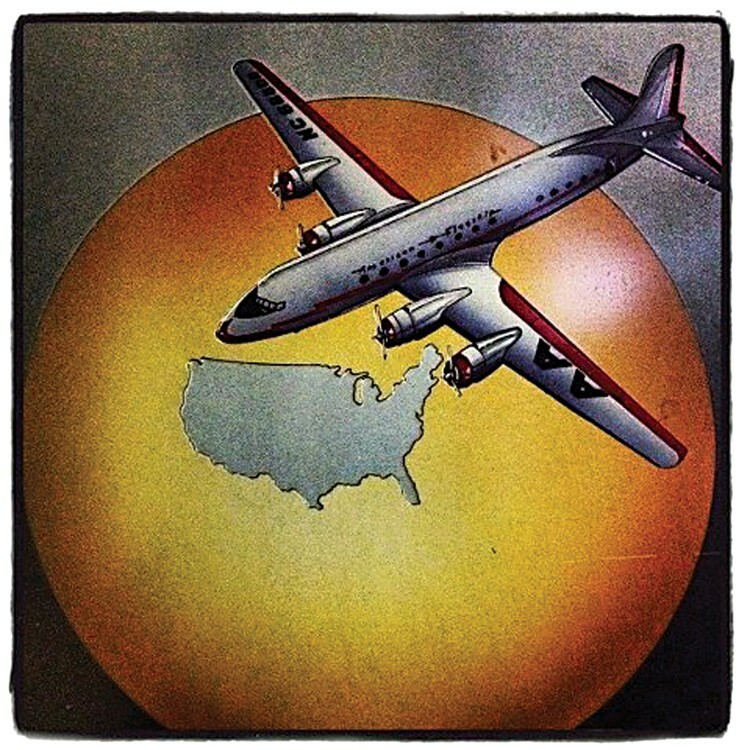 Vintage advertising art for American Airlines at the Silver Lining Restaurant. The Humboldt County government is rushing to catch a plane. Or a jet, actually -- an Embraer 140 regional jet equipped with a pair of Rolls-Royce turbofan engines so powerful they can propel up to 44 passengers (in leather seats) from the Arcata-Eureka Airport to LAX in just 90 minutes. American Eagle, a wholly owned subsidiary of American Airlines, would like to provide this service to and from Los Angeles twice a day, starting as early as June, as long as the county can do two things: put up at least $1 million to guarantee the airline's revenues for the first two years, and do it fast. What's the rush? Brett Hooyerink, a market development manager for American Airlines, explained that after some schedule shuffling in Los Angeles, one of American's five hubs nationwide, the company has a jet available. Executives want that jet plugged into the airline's summer schedule, and to accomplish that they need to select a route by this week. This has placed county officials in the difficult position of needing to move both cautiously and quickly. One the one hand, the region is in desperate need of expanded airline service. Delta Air Lines, which provided flights to and from Salt Lake City, Utah, for less than two years, abandoned the region in 2010 after collecting $500,000 in prepaid tickets, another $500,000 in revenue guarantees and $62,000 in deferred landing fees. Last April, Horizon Airlines discontinued its service to and from L.A., leaving Humboldt County with a single commercial airline, United. Adding to the urgency: A major construction project will close one of San Francisco International Airport's two main runways from June of this year until 2015, promising countless flight delays and cancellations. But on the other hand, county officials don't want to get burned again, like they did with Delta. Over the last two weeks, county staff and the Board of Supervisors have been working furiously, negotiating with airline representatives and meeting with local agencies to see if the deal can come together. Last week, the board of directors for the Headwaters Fund, the county's unique pot of economic development money, agreed to finance a loan for the $1 million revenue guarantee. That's down from the airline's original request for a $2 million guarantee. The contract that's currently on the table includes a monthly revenue target for American Eagle's service to and from L.A. If the airline fails to hit that target -- which so far is publicly undisclosed -- during any given month, it will make up the difference by withdrawing money from the $1 million in revenue guarantees. At last week's Board of Supervisors meeting, 3rd District Supervisor Mark Lovelace asked if the county would get to share in the profits if the airline ever exceeds its target revenue. The answer was no. Furthermore, American Eagle wouldn't have to pay landing fees, terminal rental fees or a variety of other standard expenses thanks to a fee waiver program that the county offers to attract new airline service. Hooyerink, the American Airlines rep, told the Journal that such guarantees and fee waivers are industry standard. "It's a way for us to ensure we don't sustain the heavy losses that are typical in the first two years or so of getting a new service up and running," he said. From the county's perspective, these concessions may be a risk worth taking (again), given the potential economic benefits of the new service. Many local business owners say their economic growth depends on reliable transportation in and out of the area. "Look, we just need it," said Briar Bush, general manager of Lost Coast Brewery. Humboldt County Film Commissioner Cassandra Hesseltine said the county pulled in $1 million last fiscal year from TV commercial productions, print ad shoots and independent movie projects. She predicted that direct flights to L.A. would vastly expand those revenues. HSU President Rollin Richmond said airline service is vastly important to the nearly 90 percent of Humboldt State University students who come here from outside the area. There are a number of reasons to believe things will work out better this time around. Gregg Foster has worked as hard as anyone to attract another airline to the region. Chair of the county's airport advisory committee and former executive director of the Redwood Region Economic Development Commission, Foster pointed out that Delta's service started amid record high fuel prices and just months before the worst recession in more than 60 years. Plus, Delta arrived as the third airline at Arcata-Eureka Airport, while American would be effectively replacing Horizon Airline's L.A. flights. Horizon was trying to fill 148 seats per day while American would only need to fill 88. "We have data we can rely on from 2005 that shows that if [American Eagle] can just capture what was the existing traffic, they will fill their two planes per day." Last week, the Board of Supervisors unanimously directed staff to develop a funding package to finance the $1 million revenue guarantee with the following stipulations: It can't obligate any money from the county's strapped general fund, and it can't violate Federal Aviation Administration restrictions on how airport division funds are spent. Complicated, right? While county government and local economic development agencies have all expressed enthusiasm for the American Airlines deal, the big questions remained unanswered as the Journal went to press Tuesday afternoon. Foremost among these is: Who will ultimately pay for the $1 million revenue guarantee? "That is up to negotiation," Mattson said earlier in the day. It could wind up being county funds (though not from the aviation division), or it could come through a grant, or the private sector might be able to pony up much of the money, he said. "That all has to be negotiated still." The county has been working since Delta left to increase regional airline service. Sounding beleaguered but optimistic, Mattson said one thing's certain: "This is the closest we've been in a long time."